We had been hoping to get library folder watching in for 1.2, but wasn't finished in time. Read the release notes for the full scoop! Digg It! I think I speak for everyone when I say: WOOT! Great job! Awesome, its amazing how fast development is going! The one key feature Banshee is missing is folder watching support, hope that comes very, very soon! Banshee is so nice these days, great job! Has there been any progress on the Windows version? Please make search faster (haven't tried 1.2 yet so maybe you already have done that). But right now, with a few thousands songs, it's taking a long time to use the quick search. All while Amarok operates very fast and responsive. One thing that's holding me back from Banshee right now. Great work. 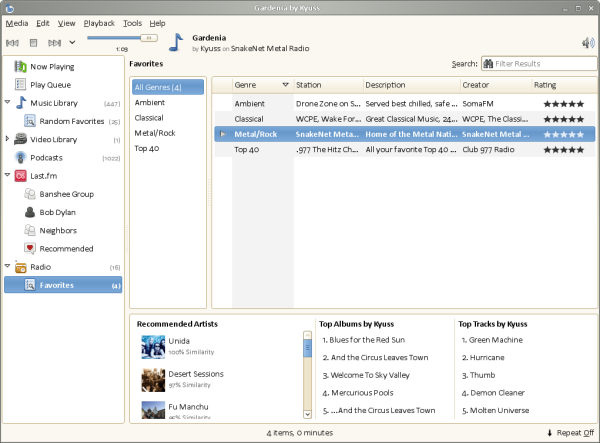 I've just updated it to have the radio support on openSUSE 11.0 and it works like a charm! Really have been waiting for the Windows version for months. Ah, excellent. I have a few albums like that and the album-browser got annoying quickly. compilation support and cover.jpg support! You people are the best! "Much improved performance and UI for automatic cover art fetching"
Where is the UI? When I click 'Tools->Cover Art->Download Cover Art' nothing happens. @Sim: Yeah, that's basically the point w/ the cover art UI - it not longer pops up all the time - was very annoying. :) When you do that, it is checking if it needs to get any album art, but it must be too fast so it doesn't pop up the progress bar. I second the wait for the windows version. I hate to be stuck without a decent media player on the M$ side. Is there a way to get multi-artist albums to show up one heading in the artist broswer? like how 'Various Artists' is used for amarok. feature-wise banshee >= 1.0 is getting nice, but I am missing bug-fix releases. if I look at the bugtracker, there are a lot serious bugs. why not work on them instead of creating new (not fully working) features? @last anon: Did you miss the "Over 80 bugs fixed" statement about 1.2? We spent a ton of time fixing bugs. And 1.2.1, which is coming in four days, will have updated translations and probably a dozen or so more bug fixes.